It’s highly possible that you’ve heard of affiliate programs before. After all, they’re a very efficient form of marketing, since they aim to provide the right audience with the right product. In short, it’s an industry that benefits both the client, the vendor, and the affiliate. If you’re selling a product, having an affiliate program can help you take your business to the next level. And contrary to what you might think, setting one up is not hard at all. In layman’s terms, affiliate marketing is a form of marketing in which someone can promote a product or service that is not theirs. Instead, the affiliate can receive a small cut of the total price of the product if he manages to generate a sale, courtesy of the actual product owner. The first and foremost advantage is, without a doubt, raising your income. Setting up an affiliate program takes relatively little effort, and the returns can be a huge boon to your business. Just by having it, you can start encouraging people to promote your product, as they will be incentivized to do so. Simply put, it’s another channel of promotion for your product. This in turn leads you to the second benefit. If you want to create a big ripple in the market, you need to find your most loyal customers. They’re the ones that will go to great lengths to defend your product, as well as promote it to new customers. For example, take a look at what Apple has achieved with its community. Its users fiercely defend the brand, and will even encourage their friends and family to buy an iPhone, or a MacBook. Your affiliate program can bolster your community and give people a bigger reason to promote your product to the masses. Lastly, affiliate marketing can give you an additional layer of visibility. Since people will now have a big reason to promote your product, they will gladly advertise it on their own. If you contact a blogger and invite him to try out your product, he might not pay attention to you. After all, you’re asking him to invest time and attention into your product without even knowing if it’s worth it. Compare this to doing the same thing, but with a solid affiliate program in place. The blogger will be more inclined to hear you out, since it’s not an only investment anymore; it’s a potential opportunity. 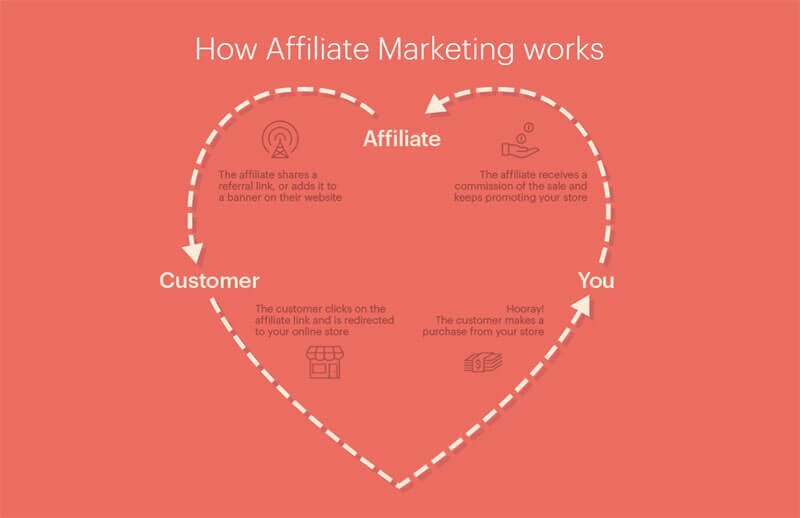 Having said all that, how does an affiliate program actually work? It is actually pretty simple. First off, an affiliate has to sign up for your program, so that he can be properly identified. This is done like any other account registration process, by using a simple form on a website. In this step, there can be some additional checks to ensure the quality of the program. Certain affiliate engines will make sure the affiliate is up to the task, and have a strict approval process in place. Here, the ref parameter indicated the affiliate ID number. In other words, this URL tells the website that affiliate 123 is bringing in a visitor. This is just an example though, and different affiliate engines may use different types of links. Creating your own affiliate program in WordPress is very easy nowadays. 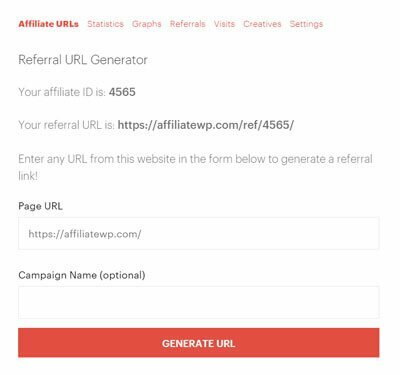 While there are many plugins that do a fine job of managing your affiliate marketing, so far the best solution I’ve found is AffiliateWP. 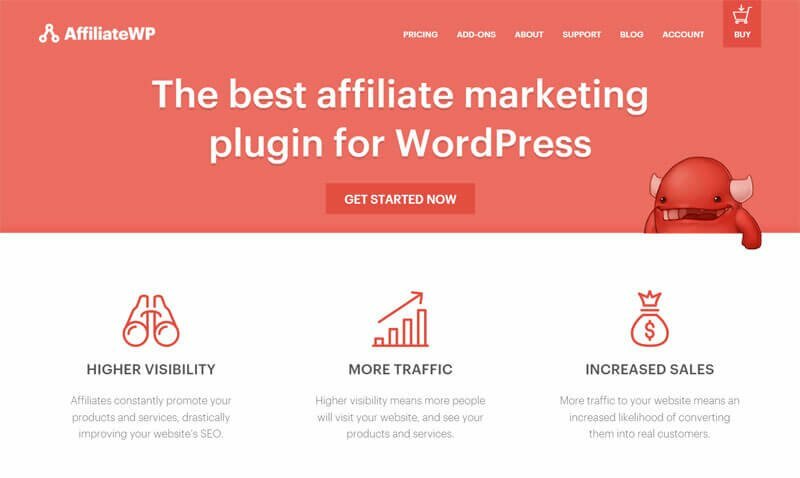 AffiliateWP is an affiliate marketing plugin that will help you manage every step of your affiliate program. It handles affiliate data, referrals, and can track your payments down to the smallest detail. And while it is only available as a paid plugin, it’s worth every penny. To set up AffiliateWP, you will need to purchase a copy of the plugin. Depending on your needs, you can go for the most basic version, or get one of the more advanced plan to take advantage of the extra add-ons. Recurring Referrals: Allows you to credit affiliates on ongoing payments, in order to further incentivize people into promoting your products. Tiered Affiliate Rates: Lets you create different ‘levels’ of affiliate commissions, so that the more sales an affiliate generates, the higher the cut. Paypal Payouts: If you use Paypal to pay your affiliates, this will help you automate everything and process all referrals without having to deal with them one by one. Once you have AffiliateWP installed, there are a few things you have to do to ensure everything works correctly. 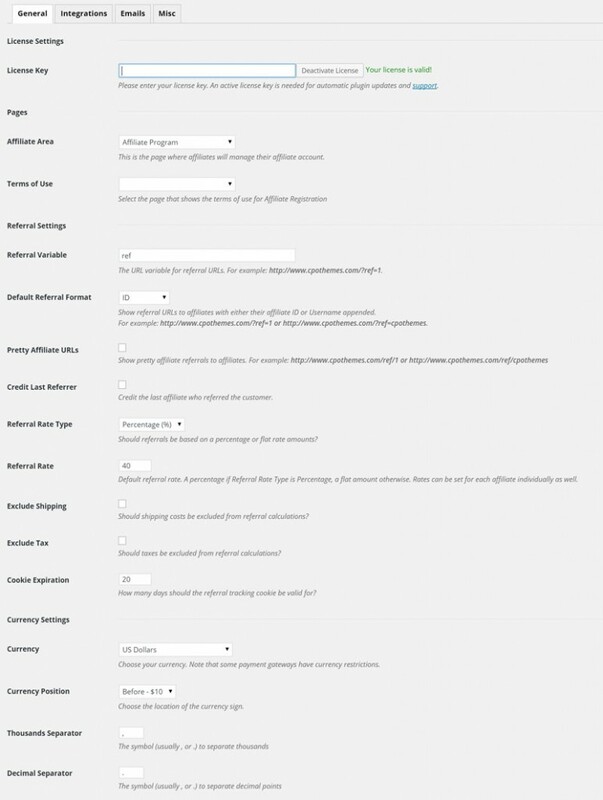 First, go to Affiliates > Settings and set the general affiliate rate to a proper value. This is very important! It will indicate what the percentage cut is given to an affiliate once he brings in a sale, so make sure to adjust it you your needs. You will also need to set the terms page andthe affiliates page, so that the plugin knows how to properly redirect users. More on these two later on. That’s an extensive list! If you happen to use one of these plugins to power your online business, then all you need to do is head over to the Affiliates > Settings menu, and in the Integrations tab check the corresponding box. And that’s it! The plugin will automatically start tracking new sales and referrals, so all you need to do is set the correct rates and you’ll be done. If you place this shortcode in a page’s content and a visitor navigates to it, then AffiliateWP will automatically grant a referral to whoever brought that visitor. In other words, it’s the same as processing a sale in an online store or completing a purchase. You can use this shortcode on a Thank You page to redirect visitors to it, after they successfully fill out a form or complete all the required steps. In case you want to accomplish this with a simple form, you can resort to the Contact Form 7 plugin and use the on_sent_ok redirection feature. This shortcode is responsible for displaying the entire affiliate dashboard, complete with its subsections. You can change this page to your liking, but remember to point to it from the plugin settings for redirection purposes. Besides that, you can also make use of two more shortcodes: [affiliate_registration] and [affiliate_login]. These two will generate forms that your visitors can use to register and login as affiliates, respectively. It is worth noting that the dashboard shortcode will display these forms automatically, whenever a guest opens the page. Now, setting everything up is rather easy, but keeping a healthy affiliate program is a tougher task. Doing things right in affiliate marketing can mean a lot to your bottom line, as it will keep people interested in bringing you new sales. Not only that, but you will also generate a lot of contacts from powerful bloggers and marketers, and in the end build a thriving community. So, ¿what are the best affiliate marketing tips? The very first thing you should do is ensure the quality of your product. An affiliate program is only as good as the actual product it promotes. 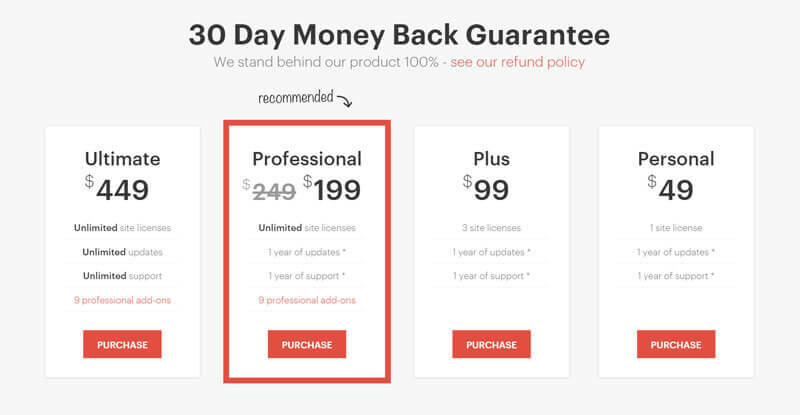 For example, selling a WordPress plugin that does next to nothing will be really hard to sell, and any potential affiliate will see that right away. Companies with a successful affiliate marketing strategy all have a great product that provides plenty of value and sells by itself: WPEngine, Elegant Themes, Easy Digital Downloads… you should do everything in your power to increase the amount of value your product delivers. Think of it as your biggest multiplier: the easier it is to sell your product, the more effective your affiliate program will be. Have you defined a clear payout policy? No matter how much your affiliates promote your product, if you don’t pay on time they won’t last. And so on. This policy will help you avoid any potential misunderstandings with your affiliates, and keep everything running smoothly. Also, the clearer your wording is, the fewer misunderstandings you will experience. You should always strive to make your affiliates’ life easier, one way or another. The simpler it is for them to promote your product, the more leads they will be able to drive to your site. AffiliateWP has a functionality named Creatives, where you can upload just about any kind of file for your affiliates to use. This will appear in their affiliate dashboard, where all resources will be readily available. Do not be afraid to create a comprehensive page with as many resources you can, so your affiliates know where to look. Another part of keeping your affiliate program active is to run various promotions every now and then. If possible, you should incentivize your top performing affiliates with additional rewards, so they continue to promote your product. Another way of doing this is to create different tiers for affiliates, so that the rewards get progressively better with each level. For example, you could give anyone who is starting out a baseline 35% cut, and anybody that exceed a certain amount can get 40%, 45%, and so on. As you can see, using WordPress to building an affiliate program from scratch is not hard at all. Having one for your online business will help you get connected with the community, and will also help your bottom line. Nevertheless, it is important to keep it healthy and make sure your affiliates feel well-rewarded. If you manage to do so, it will do a lot for you in the long run. Have you ever created an affiliate program already? Tell us!